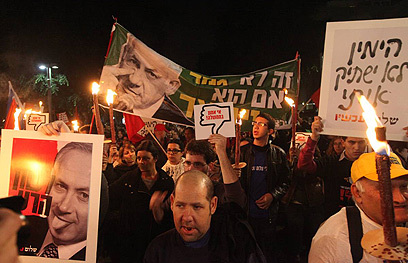 Some 2,000 people gathered in Tel Aviv's Rothschild Avenue on Tuesday in protest of the amendment to the Defamation Law, which passed its first Knesset reading on Monday. The protest, which was organized by Peace Now, came on the heels of an initiative proposed by right-wing Knesset members, which aims to increase the maximum compensation paid for libel violations to NIS 300,000 (roughly $80,500) – six times what it is today – regardless of proof of damage. Knesset members warned that the amendment would erode Israel's democracy and violate the freedom of the press. Protesters held torches and red flags and shouted: "Bibi, Bibi, you've gone too far – Israel is not Iran" and "The Right is running wild." Meanwhile, some 100 right wing activists gathered opposite from the protesters, and called out: "Obedience now" and "one country, one people, one leader." "Today's protest is for those who believe in democracy, freedom of expression, freedom of press, equality and the rule of law," one of the demonstration organizers asserted. 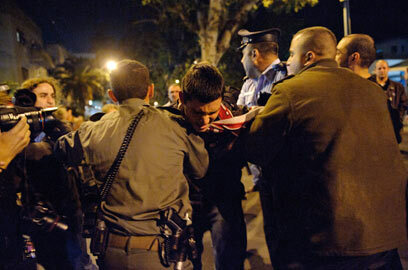 "The cowards in the Knesset turned the court, the media and the human rights organizations into their own punching bag. We are raising our heads today and saying that there is a sane majority in Israel and we will prevail," the organizer stated. MK Nitzan Horowitz (Meretz) addressed the crowds, calling that the controversial legislation "fascist." Horowitz stated that the bill aims to "persecute the minority that can contradict the majority's decision – including the journalists, human rights organizations, and women. "The rot starts at the top and the top is Benjamin Netanyahu, Avigdor Lieberman, Eli Yishai, Ehud Barak and Yaakov Neeman. The government is urging to pass these laws now, as an answer to the social protest," he stated. At the end of the demonstration, a number of protesters egged a building on King George Street and clashed with police officers who tried to disperse them. One man was arrested after egging a police officer, and a Border Guard officer was lightly injured from crowd dispersal means. See all talkbacks "Thousands protest against 'libel bill'"